The recipes only signify indoor/houseplants. What is used for outdoor plants? The same techniques can be applied to outdoor plants affected by these pests as well. Remove scale insects from plants using a soft cloth or sponge dipped in insecticidal soap. Insecticidal soaps or neem oil are good choices, but keep in mind that these are not cures. 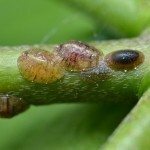 You will need to follow up with a spray mixture of insecticidal soap and horticultural oil to control scale insects. The oil smothers the slow-moving insects. You might also want to consider introducing predatory insects (such as the parasitic wasp), which feed on these pests.